Or maybe I will say weepy. But still. I don’t get weepy at work. Work is work, and it is important to me to keep my emotions–the raw ones, like anger or sadness–clear of my office. Emotions–the big ones–get in the way at work. At least, at my work. Yet here I was, opening a gift that I felt I didn’t deserve. A gift left for me, thanking me for my help when I was out sick during a two-day meeting that Erica, Gabriela and I co-organized by email, across the country. This was the second year in a row I have been out sick when they have arrived. My gift wasn’t a box of chocolates. It wasn’t a mug or an office plant. 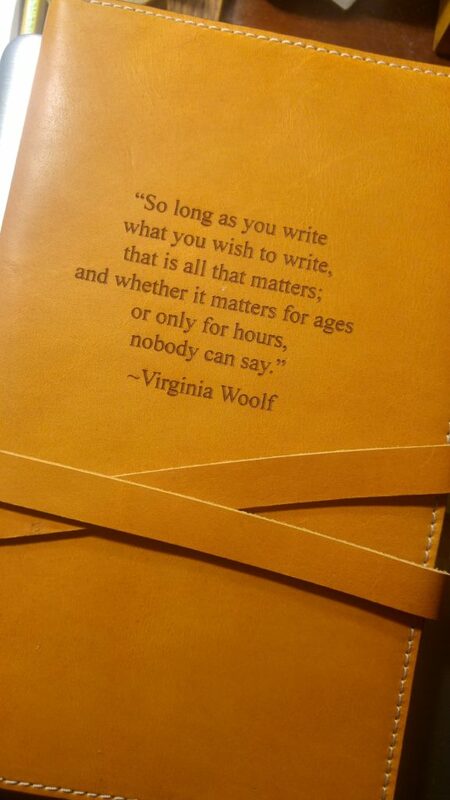 My gift was a soft, leather journal, from a one-of-a-kind shop in Mooresville, North Carolina, miles away from my Seattle office. This gift was a journal with white stitches that edge a caramel-colored covering that smells of care. Virginia Woolf’s books sit high on my shelf in my bedroom. They are books I’ve taken with me from New York to New Jersey to Washington, books I haven’t been able to part with, even in my most dejected state. And here her words come to me again, from two, kind women who made their way to my place of work, armed with many things to ensure a successful meeting, and among those things, an offering to me that unbeknownst to them was exactly what I needed. And there it was: one of those raw emotions, spilling over me as I sat in my chair, my door closed, steeped in gratitude.